The Ducati Diavel 1260S is a riding experience that you just can’t get anywhere else. A bike this solid-looking and brawny shouldn’t be able to dance through corners in the way that the new 1260S does. Yet the new Diavel handles like a sports roadster half its size, gives acceleration thrills to rival any hotrod, is comfy enough to ride all day, is as sophisticated as a top-spec sportsbike, and has the style to hold those long, lingering looks over you shoulder as you close the garage door. 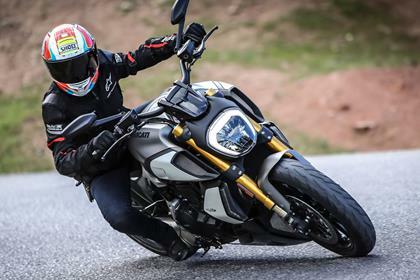 The electronics package and DVT engine bring the Diavel bang up to date after eight years in no-man’s land - and in terms of performance and spec, there quite simply isn’t another bike to rival it. All hail the MegaMonster. Although the riding position is exactly the same as the previous Diavel, the entire chassis is completely new. The most dramatic part of the Diavel’s transformation is the way that it handles. The old bike was no slouch in the corners, and handled much better than its looks would suggest, but the 1260 has moved the game on dramatically. It’s incredibly easy to steer and changes direction with a lightness than belies its 244kg. In fact it feels much lighter than the old Diavel despite being 5kg heavier! Just as before, there’s 41 degrees of ground clearance, with the pegs only touching down around the tightest of Andalusian corners - but for everyday, fast-paced riding here in Britain, there’s ample lean on offer. The whole chassis package has been redesigned. Starting with the front end, the steeper 27-degree rake angle and 120mm trail means the new bike’s geometry is closer to that of a sports roadster than a cruiser. This change has been facilitated by the arrival of a front-mounted radiator, rather than the side-mounted units of the old bike, which has allowed the engine to be mounted further back and closer to the centre of mass. Bolted to the top cylinder is the new tubular steel trellis frame, and to the rear is a new, shorter single-sided swingarm. But overall the new bike is 10mm longer than the previous Diavel, boosting stability with no impact on steering. The shock has also been repositioned and is now mounted laterally above the silencer, and it’s this in conjunction with increased rear wheel travel, that has also made the new bike feel much more comfortable over bumps - the old bike was a real kidney-rattler as it pummelled you over rough roads, but the new chassis provides all-day comfort and doesn’t try to turn your internal organs to pâté. The big, scalloped-out seat also helps here - it’s narrow at the front but wide at the back as well as being generously padded. Stick a screen on it and you’d easily do long days in the saddle, no worries at all. 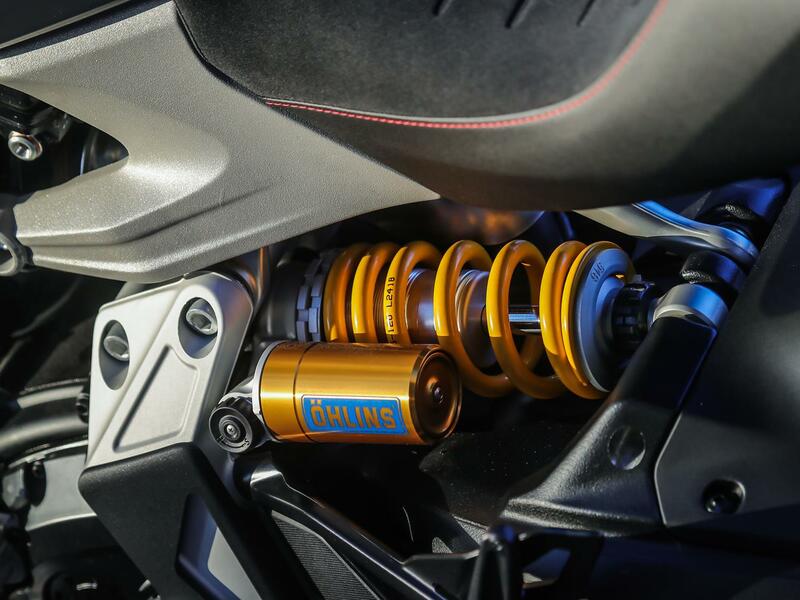 The Öhlins suspension provides damping that’s just right for road riding - doing both a good job at stabilising the Diavel’s considerable weight whilst braking hard and also ironing out road imperfections. The Brembo M50 calipers look stunning and are simply perfect, both in terms of power and feel, but I’d say the standard bike’s Brembo M4.32 radial monoblocs will be just as good. 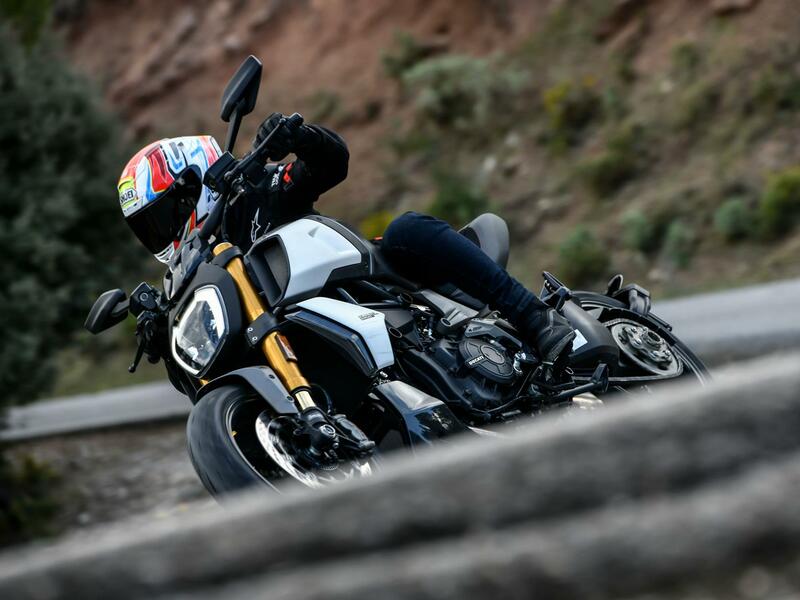 In spite of all the electronics blinking away keeping you safe, the mechanical feel and feedback the Diavel gives to the rider makes you feel very confident exploiting the amazing engine performance when powering out of bends. 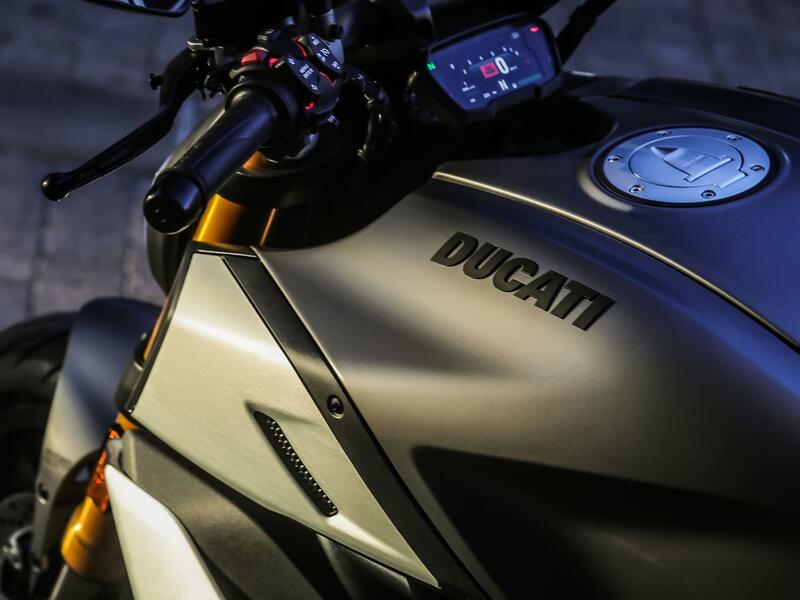 First introduced in the Multistrada, the Testastretta DVT has also graced the XDiavel. In the new Diavel, it’s been optimised via mapping for maximum performance and feels more aggressive and sporty than it does inside the Multi or XDiavel. It’s something of an iron fist in a velvet glove. For road riding, the super-sophisticated 1262cc V-twin is damn near perfect: the insanely clever hydraulically actuated variable valve timing system works seamlessly at all points in the rev range to deliver a feeling of limitless power, whatever gear you’re in. It’ll plod along smoothly through town, or you can thrash its upper limits in full attack mode and it’ll respond just like a sportsbike. 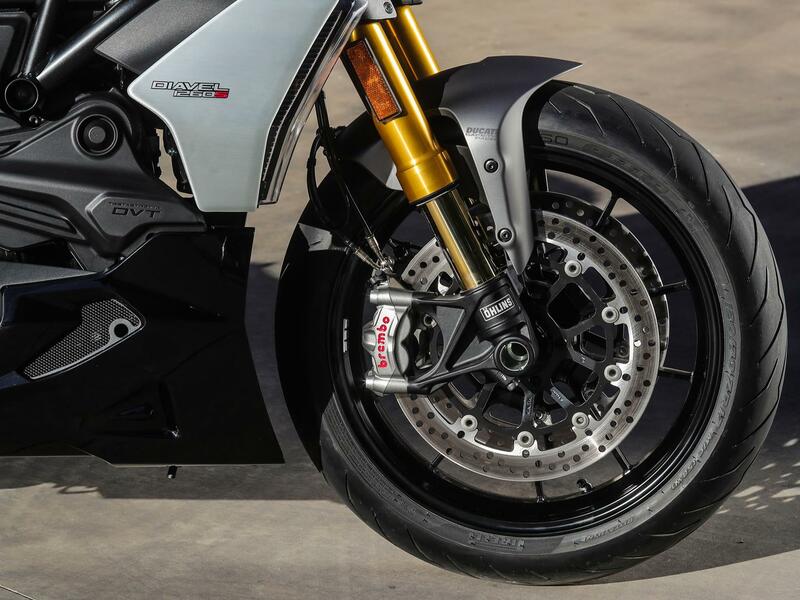 It’s massively flexible, and - god knows how Ducati got it through noise homologation - the sound from the new low-slung silencer sounds like someone’s stolen the steak from a pride of hungry lions - it really roars and barks. Peak power is up 7bhp on the old Diavel, but crucially the new bike makes more torque at almost every point in the rev range than the outgoing machine. There’s a massive 95ft-lb at 7500rpm - but it makes over 75ft-lbs at just over 3000rpm! It’s keen and revs freely, and there’s none of the agricultural feel that was so common from older Ducatis. It’ll pull higher gears at low speeds and does so pretty smoothly. The only blot on its copy book is that the throttle response in Sport and Touring mode is quite abrupt (more so in Sport) and makes the bike lurch at small throttle openings, which becomes a bit mind-focusing when negotiating tight corners in torrential rain. There’s a lot of engine braking too - which is great for high-speed riding on fast, flowing corners as it means you don’t have to touch the brakes, but can be unsettling on tighter, slipperier corners when it can make it difficult to balance the bike. 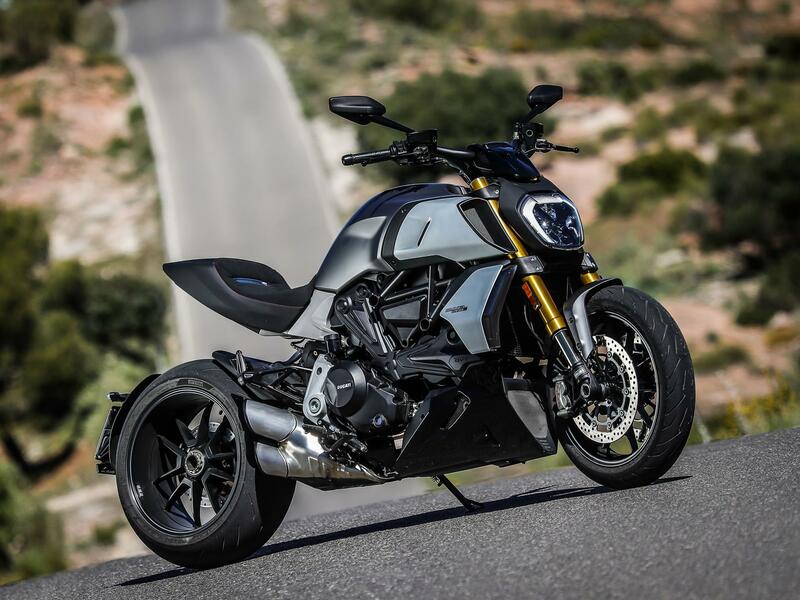 Previous models of the Diavel have been extremely reliable, with only a couple of recalls early on relating to the keyless ignition failing to unlock the steering lock, and another for a coolant leak. As this is a heavily updated model, the 1260 is unlikely to suffer those problems, and modern Ducati reliability is extremely good. As you’d expect from a premium bike like this, build quality is impressive. This is a £20k bike, and that’s an awful lot of money. However, Ducati have attempted to ease the financial pain of ownership by making the service intervals impressively wide - it’ll only need to see the dealer for an oil service every 9000 miles (roughly £284), and valve clearance check every 18,000 miles (at a cost of around £378). 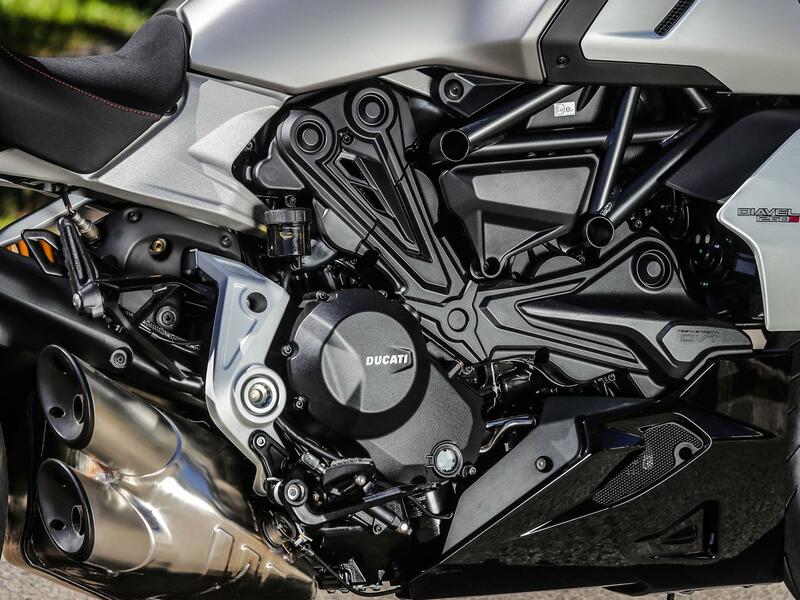 That’s astonishing for an engine with this much performance and it’s testament to Ducati’s engineering skills and component choices. Tyres, on the other hand, might be a different matter and due to the bike’s power and weight (plus the way it eggs you on to gas it up everywhere) you may be getting through a fair few of the special 240-45 rear Pirellis. 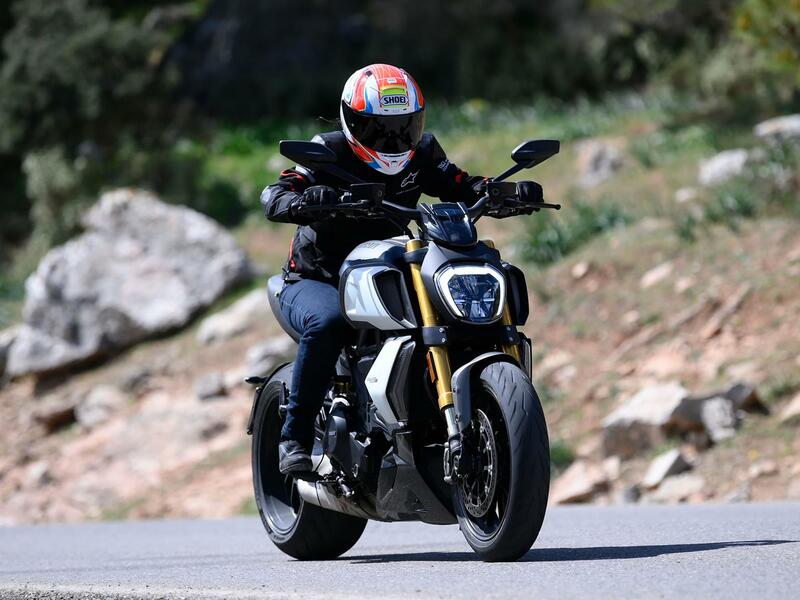 Due to the rounded profile of the tyre, designed especially for the Diavel, dealers always recommend the use of the OE Pirelli Diablo Rosso III. It’s got the lot. This S model comes with a two-way quickshifter that’s been developed using protocols from Ducati Corse so it’s really smooth at high/full throttle openings. Downchanges via the autoblipper become addictive, and make you feel like you’re on a proper sportsbike as you barrel into corners. It works very well. Both versions of the Diavel also get Ducati’s very latest rider aids package - the Evo system - which now includes wheelie and launch control. 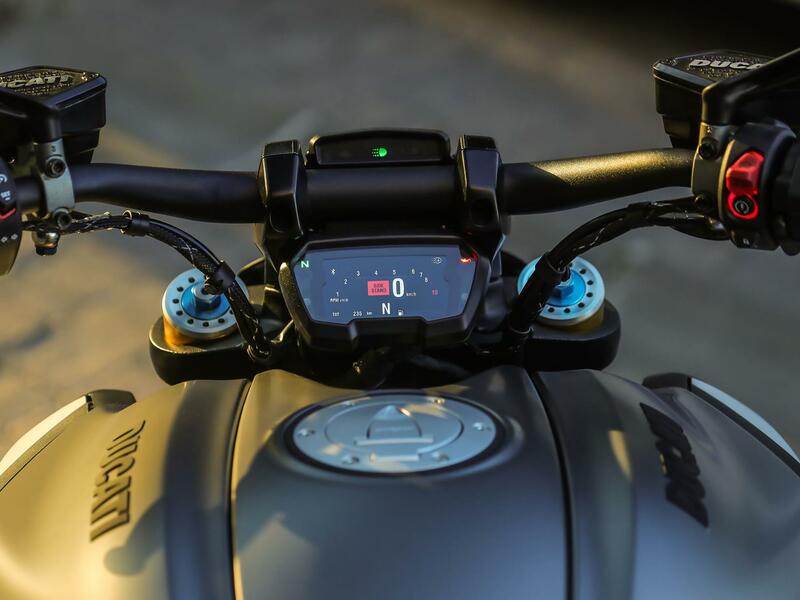 Using data about the bike’s speed, position, lean angle and rpm from the 6-axis Inertial Measurement Unit, both the Bosch cornering ABS and Ducati Traction Control work together to provide a safety net that’s completely invisible to the rider. The Traction Control now works by adjusting the bike’s throttle valves, spark advance and fuelling. 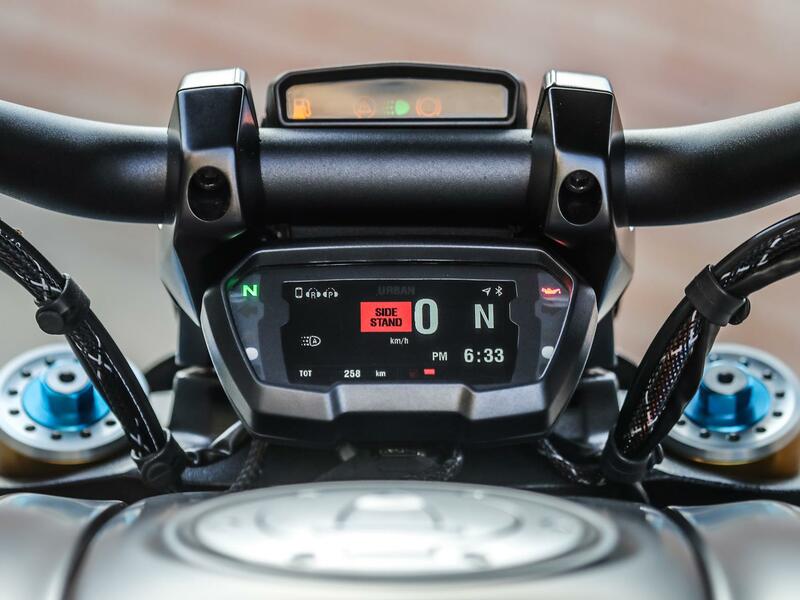 The software protocols have been developed from Ducati’s racing experience and it feels a lightyear ahead of the first generation DTC that graced the original Diavel, which you could feel chiming in when the ECU thought you were at risk of wheelspin. There’s none of that on the new model; even in torrential rain, managing the 95ft-lb torque through the crazy-wide 240-section tyre was made to feel effortless, and the chassis and electronics gave great confidence. 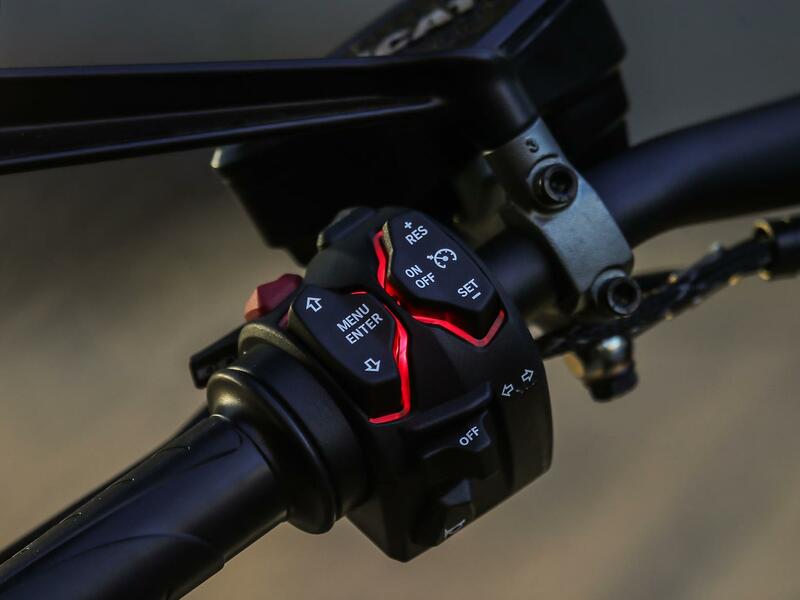 The TC, ABS, throttle response and wheelie control levels are preset within each of the three modes - Sport, Touring and Urban - but you can customise each of the modes to your own preference, should you wish. Sport and Touring give you access to the engine’s full power, whereas Urban softens the throttle response right down and limits the engine to 100bhp. The S model is also compatible with the Ducati Link app which allows owners to record routes, share data, customise modes and get software updates direct to their smartphone. There’s also Bluetooth connectivity for calls and music. Another nice touch is the 1260’s new ‘3D blade’ indicators mounted on the shoulder fairings. A feature of both models, these LED lights are visible from both the front and the side of the bike and really stand out. There’s also keyless ignition. 2011: Ducati Diavel introduced. Powered by a retuned version of 1198cc Testastretta engine from 1198 Superbike. Available in two versions: Dark (standard model) and Carbon (higher-spec model with Marchesini wheels and carbon trim. 2015 Updated model with twin-spark engine and small styling tweaks. 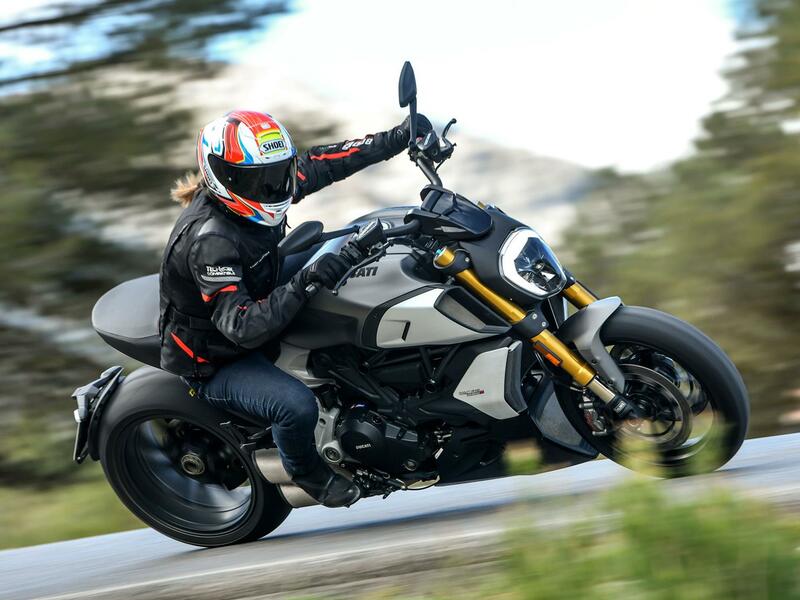 No owners have yet reviewed the DUCATI DIAVEL 1260 S (2019-on). 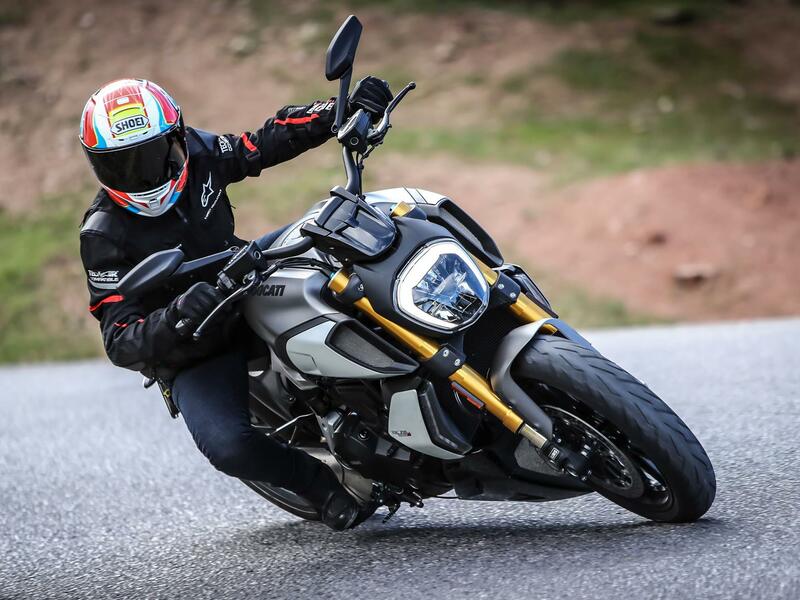 Ducati Diavel first ride: "I'm simply blown away!"